Every now and then a game comes along that is best described simply as 'deeply weird'. For Candle: The Power of the Flame that descriptor mostly applies for the look of the thing. It's been mesmerically hand-drawn, offering up a world that's rich in detail, style and atmosphere. All with a vibe that's perhaps best described as 'Ozzy Osbourne in a crystal healer's wood shop'. You play as Teku, a light-guide who serves Yaqa, shaman of the Tumaykú tribe. That's an honour that comes with a price, however. One of his hands was taken and replaced with a candle that will never run down (see? Weird!). But the fate of the tribe is now hanging in the balance. The hostile Wakcha clan has attacked and left the village in flames. Yaqa is nowhere to be seen and now Teku must step out to right the wrongs dealt to his tribe , save his master and protect the flame he guards. 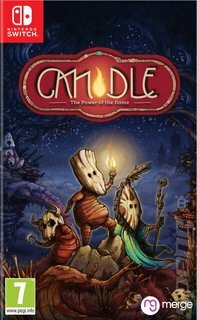 From there Candle: The Power of the Flame unfolds as a platform and puzzle game with a heavy emphasis on exploration that gives it a metroidvania feel. Players will explore an environment that has been entirely hand painted, scanned and animated for them to interact with. Combine all that with a South American and you've got a game that's nothing if not unique!